Follow Wannaskan Almanac by email to receive notice of new posts. Hello and welcome to another Happy Saturday here at the Wannaskan Almanac. Today is April 13th. Spring is on strike, but we'll make the most of it and be sunny in spirit. I hope you enjoyed celebrating National Library Week as much as I did. Did you check out books? Did you give your librarian a happy high five? If not, there's always next week. Heck, we can celebrate libraries all year! I have a stack of kid book recommendations for you this week that are tried-and-true in my own home. 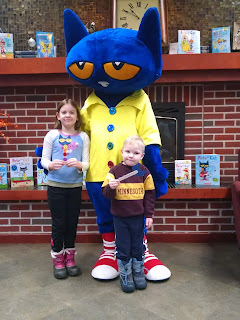 Pete the Cat books by Kimberly and James Dean - Pete the Cat is one groovy cat. In our house, he debuted with the story about his four groovy buttons. 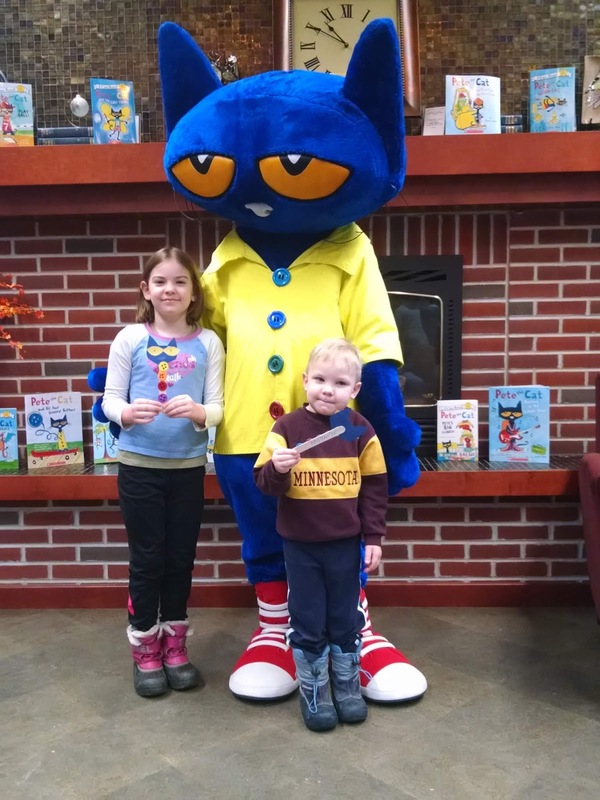 Admittedly, we haven't seen much of Pete this school year, but in the last month he has made a big come back - first at the Roseau Public Library in person (Er? If he's a cat, I suppose technically he can't be there "in person.") - and then in several books that made their way home to us. Thanks to Pete the Cat:Three Bite Rule, the First Grader and the Toddler are willing to taste just about everything I cook. This usually (but not always) leads to the hungry kids gobbling up the rest of the meal. Not only are there groovy Pete the Cat books, there are also groovy Pete the Cat tunes including a Three Bite Rule song. Our hands-down favorite though is Just Gotta Be You. 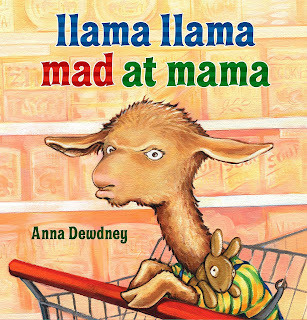 Another family fave is the Llama Llama series by Anna Dewdney. The pictures are a marvel and the rhyming style is simple but both heartwarming and wise. These are the books kids and I cuddle into with kakavičko (hot chocolate) and a warm fuzzy blanket. (Perfect for this snowy weekend!) From the library, we recently checked out Llama, Llama and the Bully Goat about a billy goat who isn't using his best manners, but with a little help, learns how to play nicely after all. 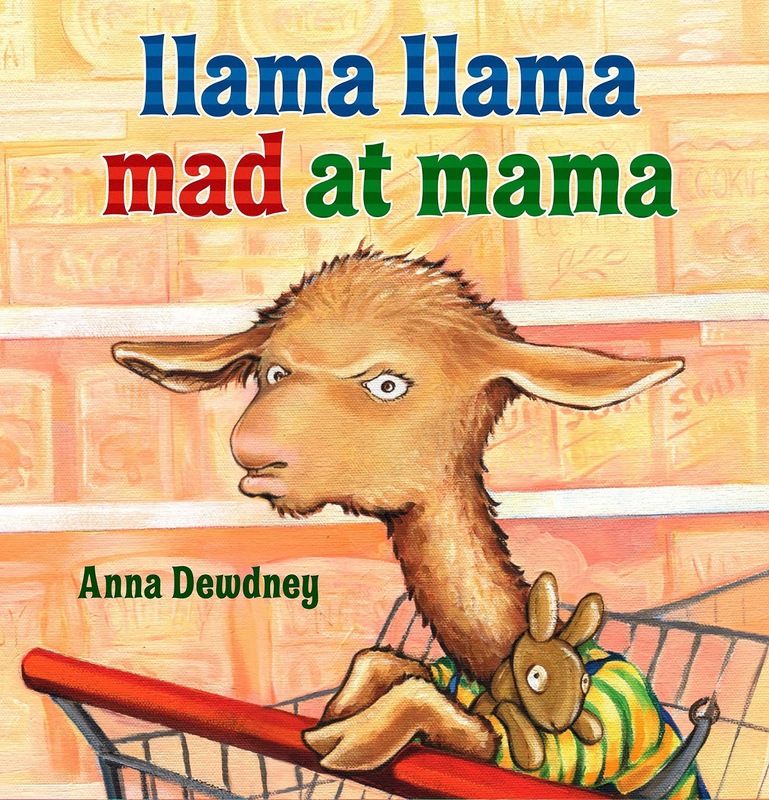 I would have to say that my favorite Dewdney book is actually not about Llama Llama, but his friend Nelly Gnu. In Nelly Gnu and Daddy Too , Nelly's daddy helps her build a cardboard house. I happen to have an intense love and fascination for cardboard houses. My single greatest memory of Kindergarten, aside from using the toilet that was housed inside the brown "trunk" of a large "tree" in the classroom, was building a fort out of cardboard rectangles fashioned after red bricks. Just this week, I ushered the littles into the big box "house" we recently got from kids' babička and dědeček "all the way from the Czech Republic." Preparing this blog post, I learned that this fabulous author-artist passed away in September 2016. This loss feels heavy in my heart, not because I knew her personally ( I did not), but because her books have brought my family and me so much joy. A collective feeling of loss is always felt, I think, when a great talent and positive contributor to the world passes away. Here's her very nice New York Times obituary which includes how she got the idea for her dear Llama Llama. Thanks to the copious amounts of etiquette research I've been doing the past two years, I discovered a sweet little gem of a manners book. Tea for Ruby, authored by the Duchess of York Sarah Ferguson, is also illustrated by the Fancy Nancy illustrator Robin Preiss Glasser. The pictures tell the story as much as the words and is a story for the eyes! Be sure to start at the VERY BEGINNING, i.e. starting with the illustrations on the front cover and right smack on the very first page, usually reserved for boring 411 stuff like title, publisher, copyright, etc. This is also a great book for reticent readers. Usually, the First Grader and I like to share the reading. She gets to be Ruby, who has the same line throughout the book, "I've been invited to have tea with....The Queen!" and I get to be all the other characters who remind her to use a variety of good manners. 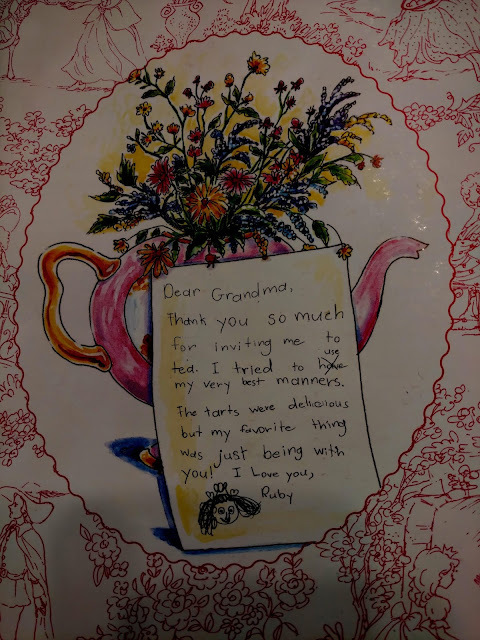 When the big day arrives, while Ruby gets dressed and her mama brushes her hair into tight pigtails, she talks through her list of manners to remember for the momentous occasion. Wait until you see the Queen! As Fancy Nancy would say in fluent French, "Oo-la-la!" Again, I have to confess, I have a favorite-favorite part of the book and it's actually not in the story at all! On the very back cover you'll find a thank-you note Ruby wrote, thanking the Queen for hosting an unforgettable tea. Parents, if ever you need a template for your kid on writing thank-you notes - THIS IS IT. If you're super interested in this book, but maybe not motivated enough to actually purchase the book or visit your local library, here's a YouTube video from The Cozy Chair. Enjoy! Do you have some book recommendations? Let me know! Share your suggestions in the comments below or email me at kim@redshoeswriting.com. Hello! The WAKWIR is back from a surprise vacation and is back to write some more! So, while I was gone, I went through some quite thematic events. First, I saw the FIRST Robotics competition and witnessed Team F.R.E.D. get the opportunity to get to the World Competition in Detroit Michigan.. I took the English MCA (Minnesota Comprehensive Assessment) Test and bought a $10 game called Machinarium, which is a point-and-click game that is very addicting. ( It’s also really hard.) And just yesterday, I took a 100 point quest (a quiz and a test smashed together) that I did not study for; but I got 92/100! My life is weird. I tried to to make myself look like a hacker and went onto one of my 3 Gmail accounts and then I typed on all three of my accounts on different hangouts! And, they didn’t know who I was! (until I told them). Soooooooooo yeah! It's been a wild few weeks,(not to mention Track practice) but I managed to cope with it. Also, I have big news! Two weeks ago, I got my first phone! Now, before you start asking me what kind it is, let me just tell you that it’s a flip-phone. But, it’s a good flip phone. You can connect to the internet, and watch youtube, and all that jazz! But, the only downside is that I have to pay for service. Yeah! That’s all I’m going to say today, and wish me well on my next session of the Math MCA Test next week! That’s all for today, and bye bye from the WAKWIR! The then 21-year old sportsman was also the first person of African heritage to win a major golf title. Tiger Woods is considered one of the most successful golfers of all time. The emergency prompted Jack Swigert's famous quote “Houston, we've had a problem”. The crew managed to return to Earth safely. The Greek composer and politician was interned in the concentration camp of Oropos by the right-wing military junta. The solidarity movement demanding his release included Dmitri Shostakovich, Leonard Bernstein, and Harry Belafonte. Transit 1B was primarily used by the U.S. Navy to update the navigation systems aboard their Polaris submarines. Brigadier-General Reginald Dyer ordered his men to shoot into the crowd, in his own words “to punish the Indians for disobedience.” The Indian independence movement grew considerably after the Amritsar massacre. Keep your snow shovels out and and make it a great Saturday! Those of you who read my work have probably noticed that I tend to be sarcastic, trivial, and sometimes humorous in my writing. I will go away from that today because there isn't anything trivial about this date. On September 11, 2001, America was attacked by terrorists. At 8:46 A.M. a plane was intentionally rammed into the North Tower of the World Trade Center. At 9:03 A.M. a second plane was intentionally flown into the South Tower of the World Trade Center. At 9:37 A.M. a third plane was crashed into the Pentagon. At 10:07 A.M. Flight 93 was crashed into a field after the passengers attempted to retake the plane. Good morning and welcome to another exciting post here on the Wannaskan Almanac. Today is Saturday, October 6th. Super exciting update at our house! Yesterday, the 6-year-old finally got to make her much-anticipated purchase! A big shout-out to Shelly at the Marvin Home Center for helping us orchestrate a local purchase so our daughter could experience the thrills of exchanging money for goods right in our little town. As Dave Ramsey says, "Feel the money!" October 23 is the 298th day of 2018. There are 69 days remaining until the end of the year. 42 BC--The Second Battle of Philippi. Brutus was defeated by Octavian and Marc Antony. You can watch a video about that here. 1981 AD--U.S. national debt hits 1 trillion dollars. 1993 AD--Joe Carter hits a game winning home run against the Phillies. Tag them all, Joe was coined at the time. 1869 AD John Heisman (the Heisman trophy in college football is named after him). He also invented the forward pass in football. 1940 AD Pele (aka Edson Arantes do Nascimento) was born in Brazil. You can see some highlights from his career here. Your funny quote of the day comes from unknown. Unknown is known to have written many funny quotes. "I used to think I was indecisive, but now I am not too sure." Now featuring Kim on Saturdays!